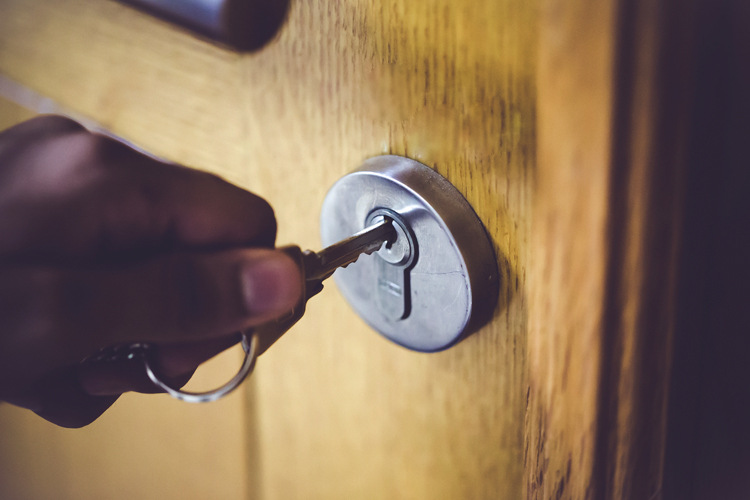 Door locks are often your home’s first line of defense against a break-in. As such, selecting the right locks – or combination of locks – is critical for protecting your property and family. Use these tips to ensure you have the right security in place to prevent burglars from passing through your doors. Nearly every home exterior door is equipped with a standard doorknob lock. While they are good to have, they should never be trusted without a backup (or two). These locks are quite easy for even novice burglars to pick. Additionally, the locking mechanism is completely contained within the doorknob housing. It’s just there to prevent the knob from being turned. A mild hammer blow is usually enough to knock off the exterior door knob, allowing a crook to then push the mechanism through the other side, rendering the lock useless. At minimum, any door with a doorknob lock should also have a deadbolt. Deadbolts work by extending a hard metal bolt from the lock housing in the door through a cutout in the doorframe, effectively uniting the two pieces. Most residential deadbolts are either single cylinder or double cylinder. A single cylinder lock has a keyed lock cylinder on the outside and a thumb turn latch on the inside. A double cylinder has keyed cylinders on both sides. While much tougher to overcome than doorknob locks, deadbolts still have vulnerabilities. With single cylinder deadbolts, crooks often break nearby windows to reach in (by hand or with tools) and turn the interior thumb latch. Double cylinders are risky because unless you leave a key in the interior cylinder (which defeats the purpose of having a double cylinder lock), family members may be delayed trying to escape the house in an emergency. An aggressive burglar or home invader can often shatter the doorframe where the bolt passes through with a well-placed kick or shoulder strike. Don’t let the appearance of technology lure you into a false sense of security with keypad locks. In essence, they’re the same as standard doorknob locks, and susceptible to the same attacks. They often include a redundant key lock, which is just as easy for burglars to picks as standard doorknob locks. And, like standard doorknob locks, the locking mechanism is completely encased in the doorknob. Breaking off the knob exposes the lock to easily being released. Keypad locks also add the complication of potentially forgetting your combination, or having someone observe the combination as you enter it. If you want to take your door locks to the next level, backup your doorknob locks and deadbolts with security chains, bolts and rods. These additional physical barriers can prevent or slow a would-be intruder. Door chains, locking bolts and reinforcing rods are generally completely contained inside the home, so there are no exterior elements for burglars to tamper with. A determined crook can, however, force his way through any barrier, so layering multiple defenses is always a good idea. Even the best-equipped exterior door is little more than an inconvenience for most burglars. If the door seems like too much trouble, they’ll simply opt for a window or sliding glass door. Your best bet to protect your home and family is to have a monitored home security system installed. With a monitored system, even if a burglar makes his way inside, he’ll likely flee the moment he hears the siren. And, if he doesn’t, the police will soon arrive to cart him off to jail. For the best security options for your home, contact Scott Alarm today for a free consultation.